It’s been a long, dismal winter fishing season for me this year. 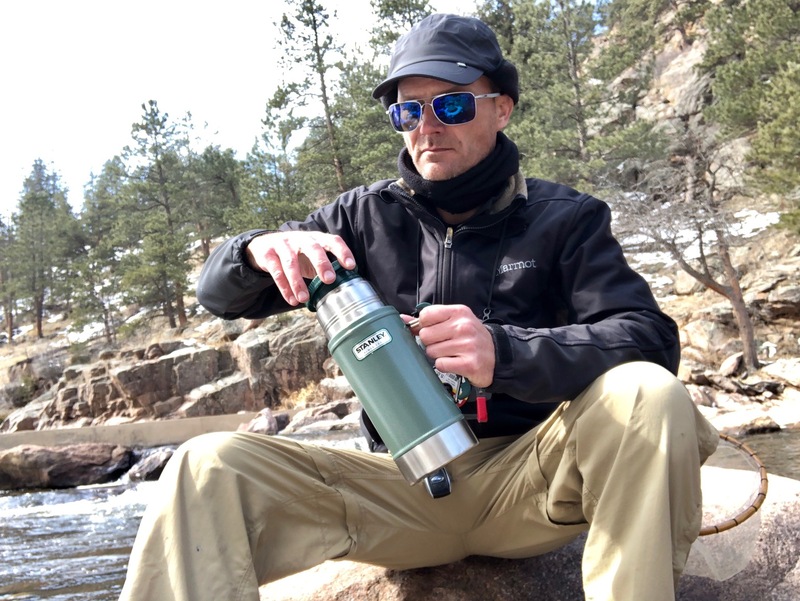 The few places with open water were crowded with desperate anglers trying to get a drift before their fly snagged a miniature iceberg or jagged ice shelf. 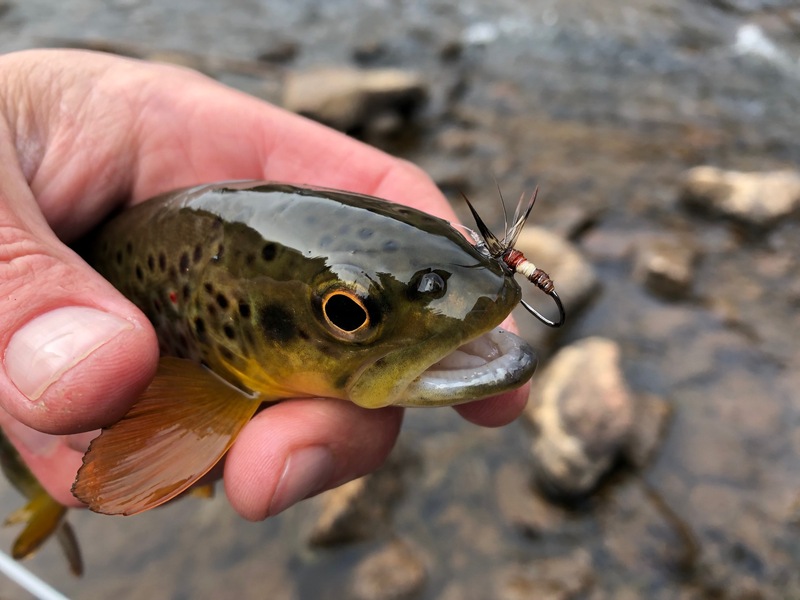 Most of the time, I was so frustrated by the crowds, low water, and lack of etiquette of other anglers, I just gave up–preferring to go fishless and just head home to tie flies than to participate in such a circus. 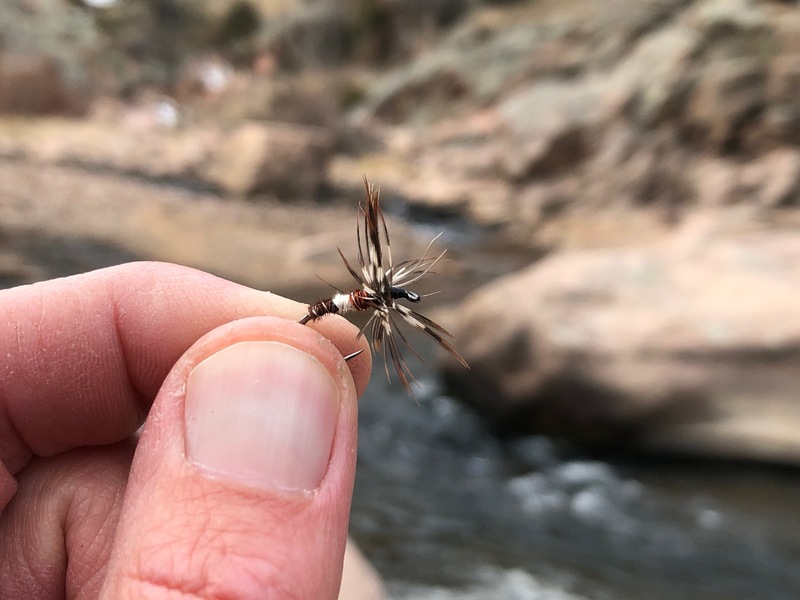 But all of that changed this month with three consecutive trips to a stream I haven’t fished in years, but one that holds some nostalgia for me: The St. Vrain. 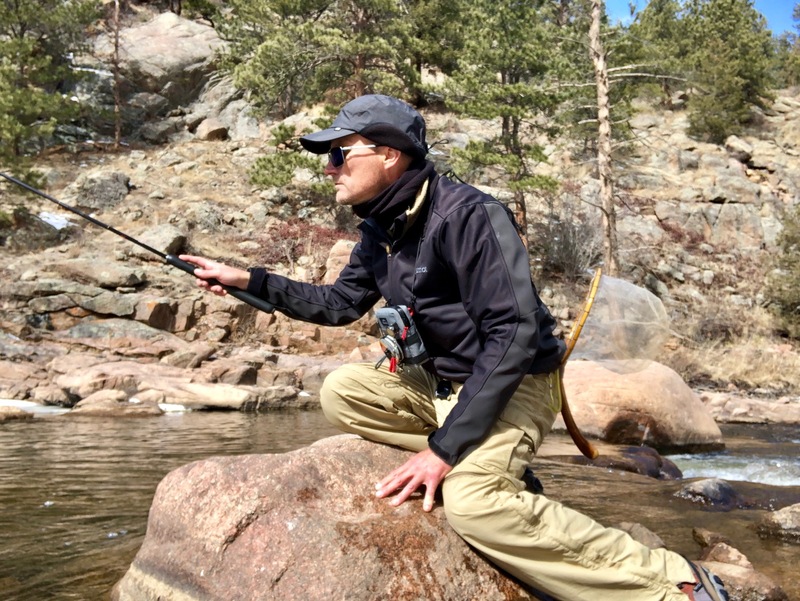 The St. Vrain was one of the first rivers I fished when I moved to Colorado 22+ years ago. 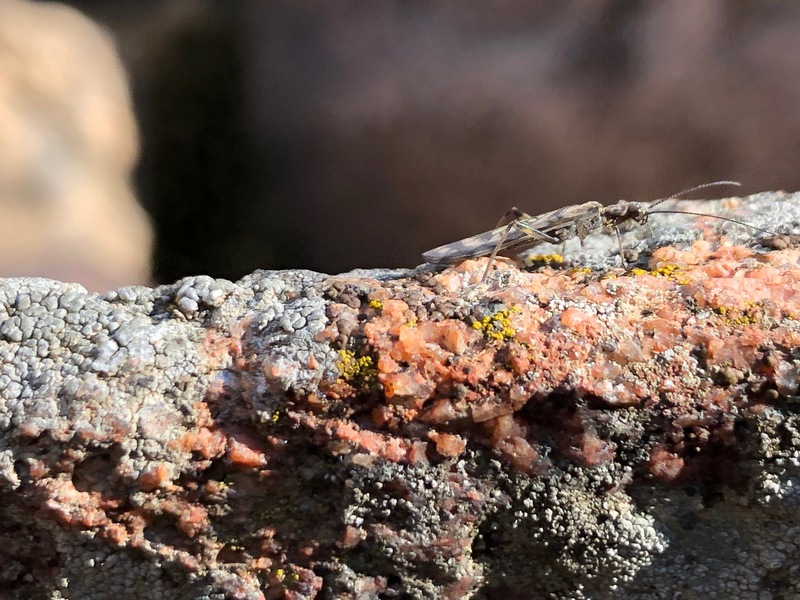 I knew about it from reading John Gierach books (it’s his home stream), as well as from the famous fly pattern, the St. Vrain Caddis. 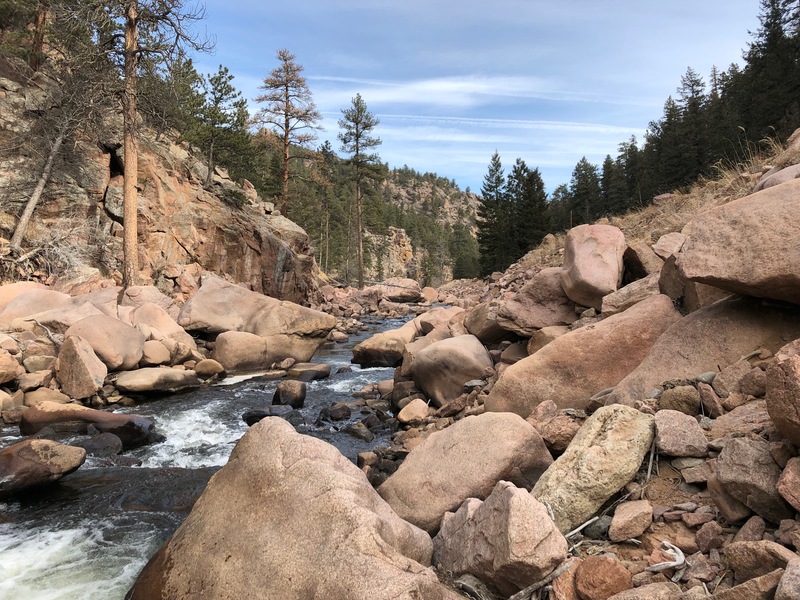 It’s a quintessential Colorado watershed, with pocket water, large boulder pools, and sandy banks. 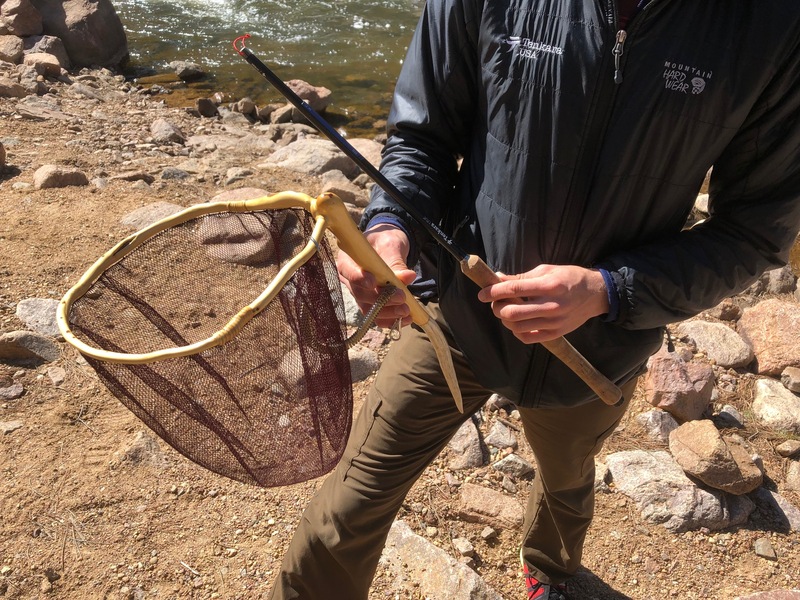 But I had stopped fishing it after the big flood many years ago which decimated a lot of my local streams–wiping out both fish and aquatic insects. 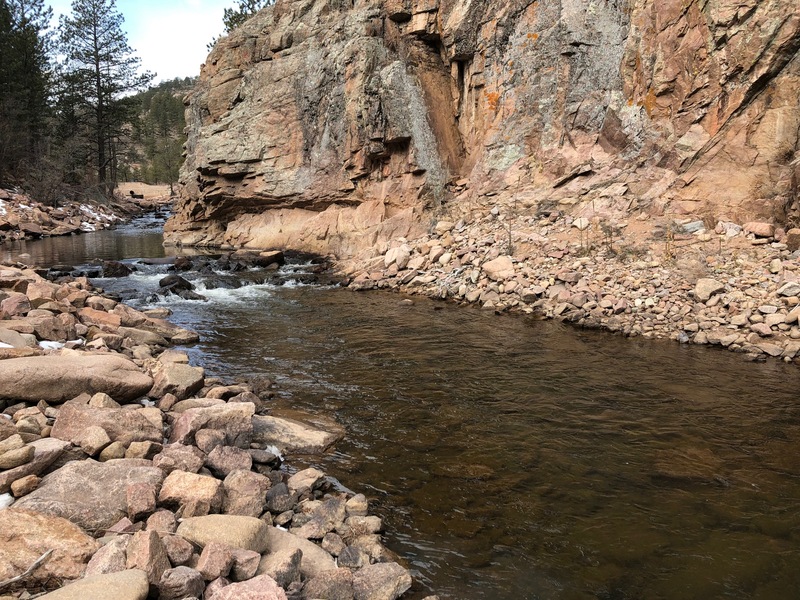 In fact, many parts of the St. Vrain that I used to fish are still dry streambed to this day and never fully recovered. But at the beginning of the month, I heard that there was a particular spot that had open water and no crowds. So I decided to give it a shot, with the hope of redeeming myself for the lackluster winter months. 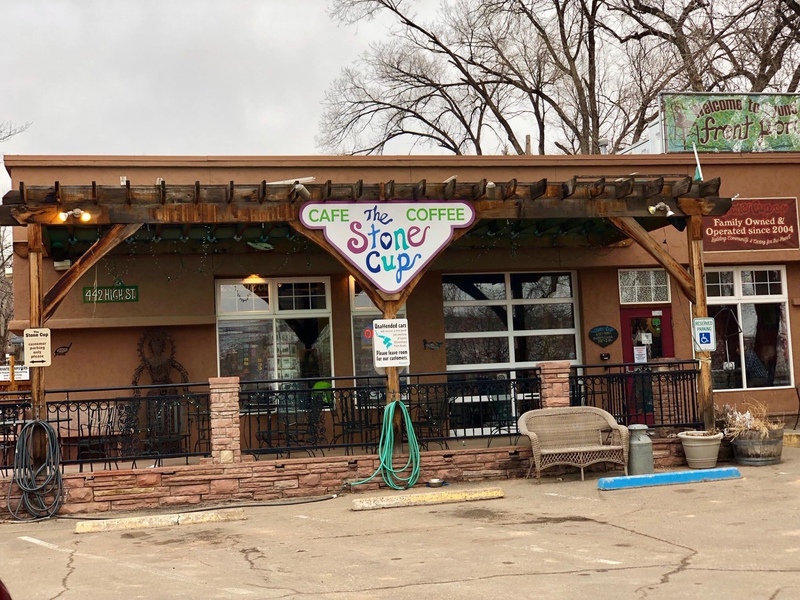 After a quick stop at Gierach’s coffee shop hangout in Lyons, I headed up to the trailhead with either hope or naive enthusiasm. But at the very least, I was well caffeinated. I only wanted two things that day: solitude, and open water. I know everyone says this and everyone knows they don’t really mean it, but I really didn’t care if I caught fish. 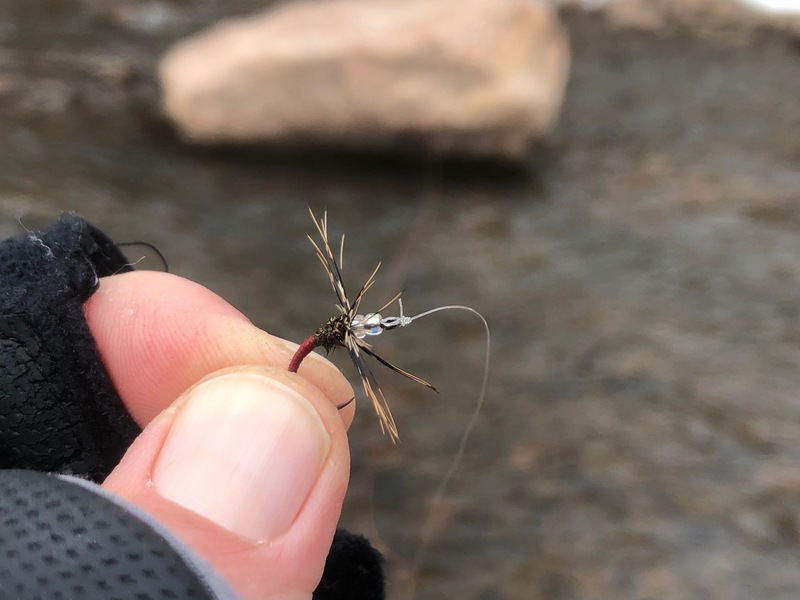 I just wanted to have a stretch of river to myself and to drift my fly in open water without snagging chunks of ice every other cast. And I got both! 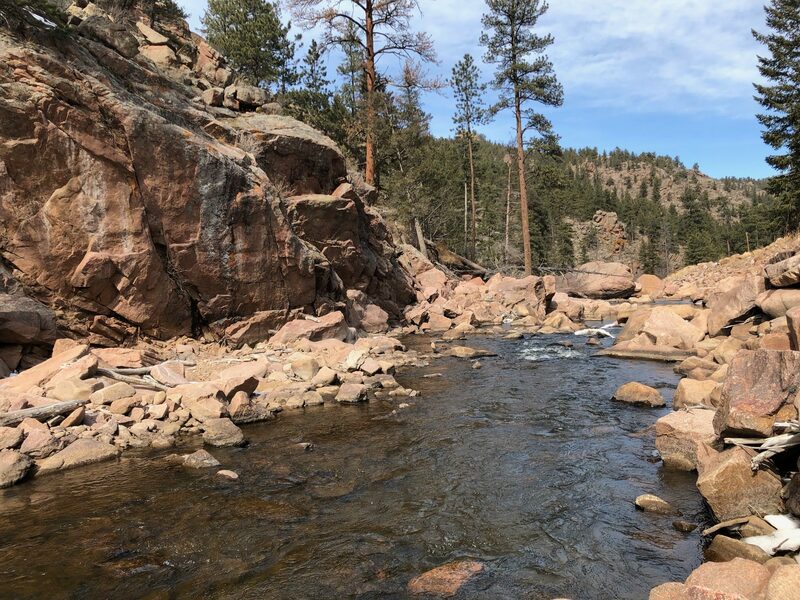 The St. Vrain either took pity on me or decided to be gratuitously gracious, but the conditions were perfect, the scenery was beautiful, and I caught fish (not that I cared. Remember?). 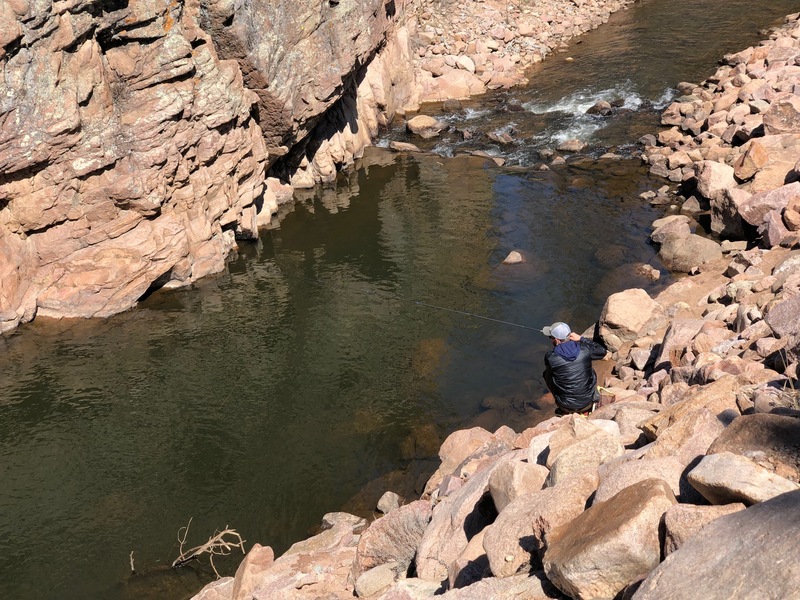 This section of the river is quite diverse, with a mixture of large pools, pocket water, runs, riffles, and dams. 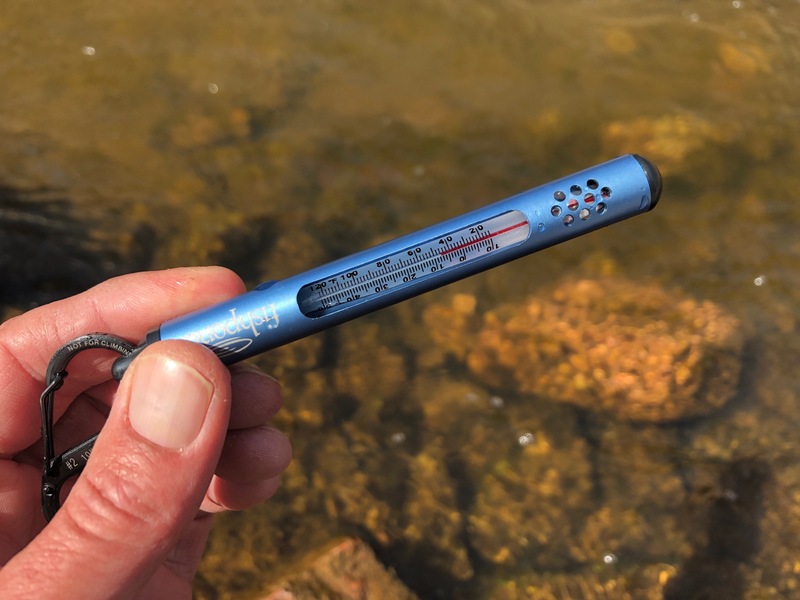 The flow and temperature were just about perfect as I made my way upstream. And once the temperate warmed up a few degrees, the brown and rainbow trout were very cooperative. 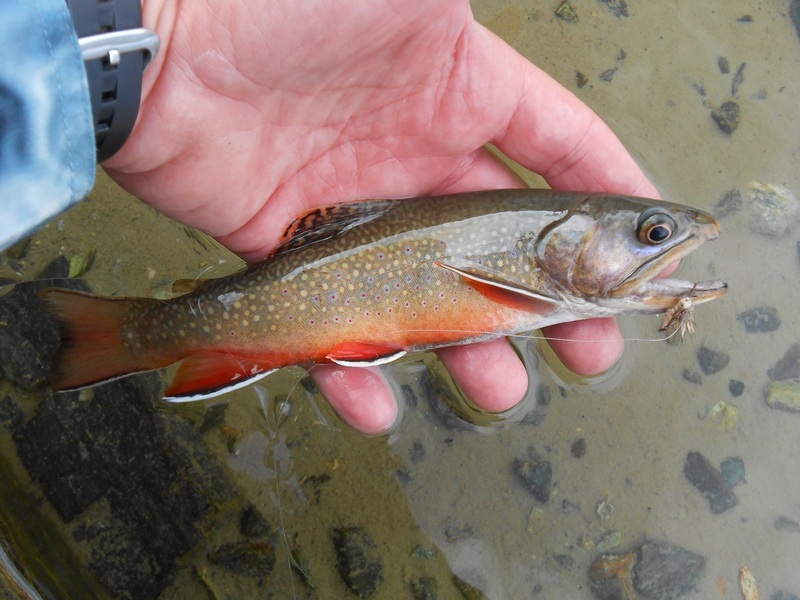 The average size here is about 8″ – 10″, so all of my fish were par for the course. I finally felt like I was back in my element. 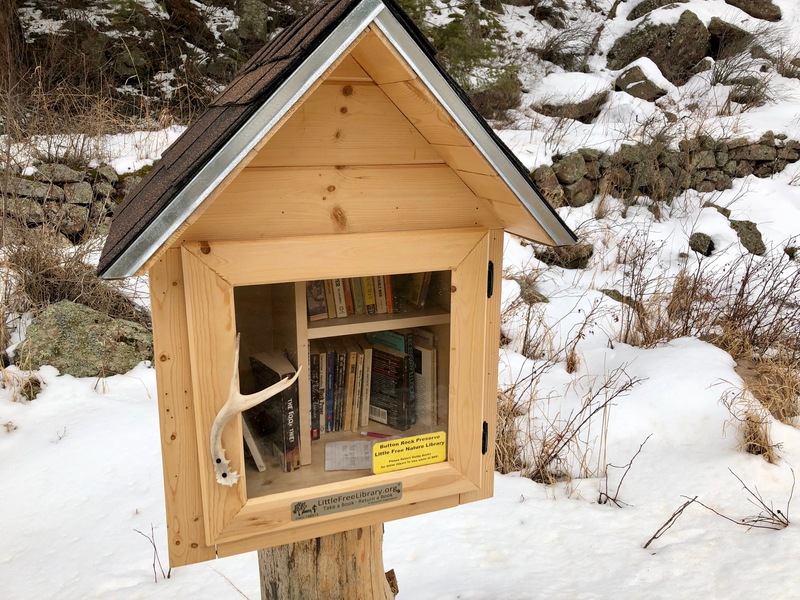 In addition to the beautiful natural scenery, there are some quirky curiosities along the way, like this streamside “little free library”. I have to admit, I’ve never seen one outside of an urban setting. Welcome to Colorado! It occurred to me to leave a copy of a Gierach book as an homage to both river and author. And I still just might. 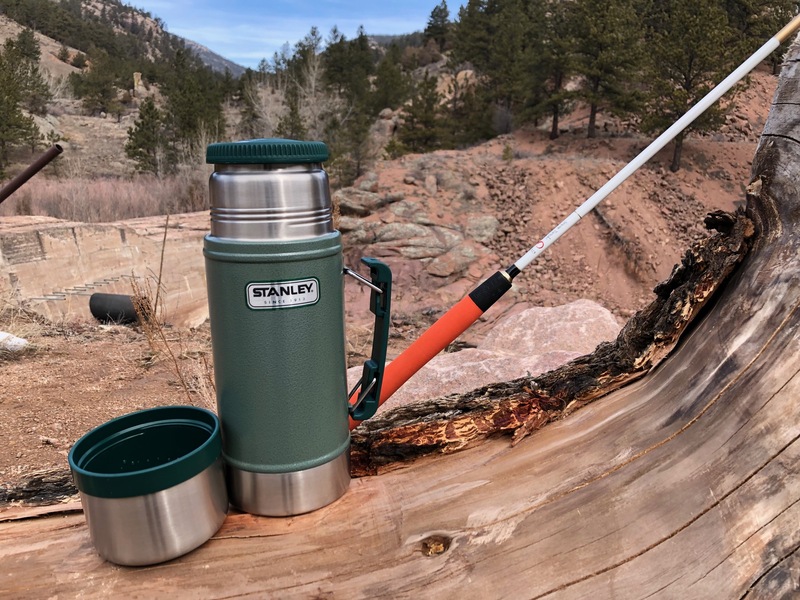 Despite the great action, sometimes you need to just sit down with some hot coffee and take in the scenery. 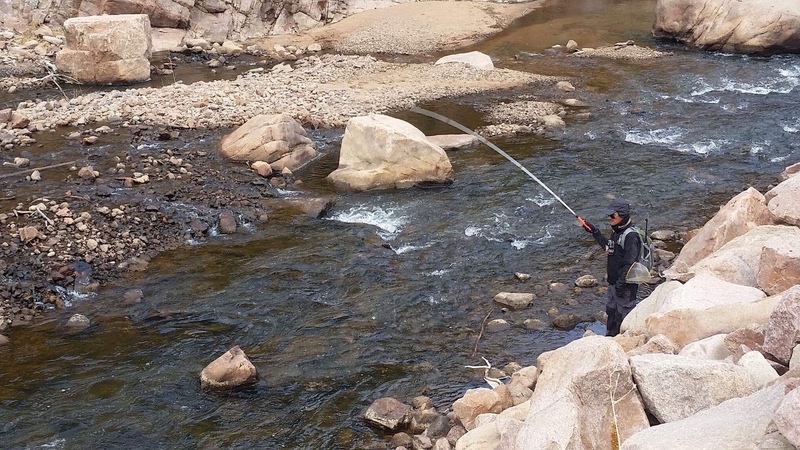 On the drive back, I saw a tenkara angler fishing by the highway. I almost stopped to say hello, but didn’t want to disturb him. 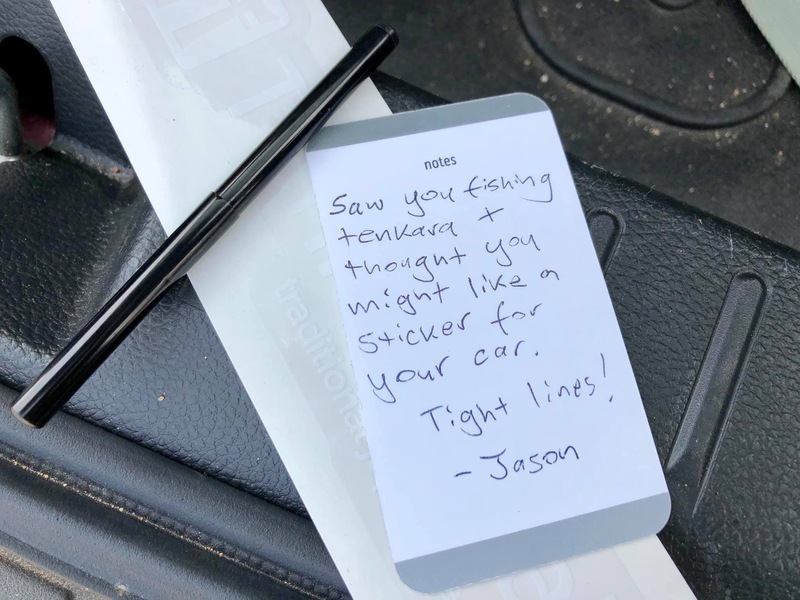 Instead, I left a little note on the back of my business card and a TenkaraTalk sticker under his windshield wiper, figuring to interrupt him would be to betray the very solitude I sought (and got) that day myself. I thought it better to leave him to his reverie and discover a nice little surprise when he got back to his car. At the end of the day, it was like the winter curse had been lifted and my passion and confidence were rekindled. Of course, sometimes days like these turn out to be one-offs and rather than a sign of what’s to come. But this was not one of those days. 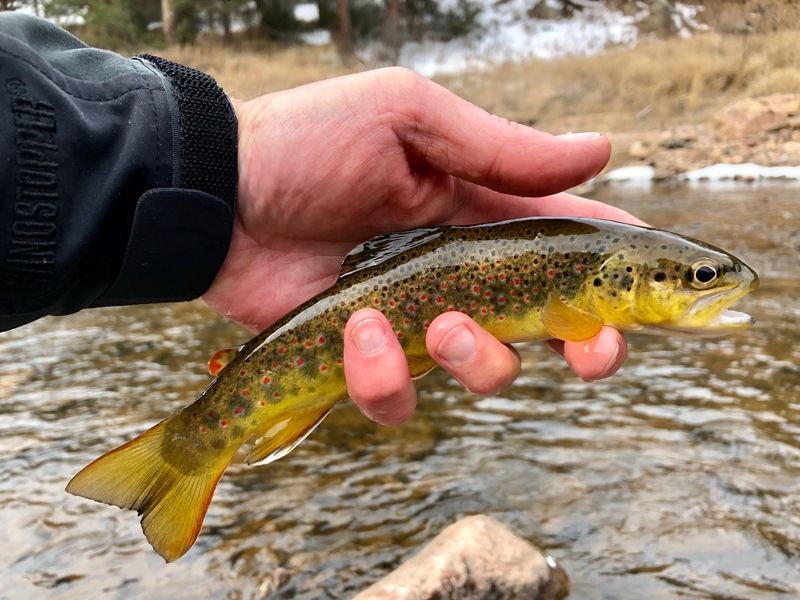 I told Dennis about my trip and after feeling a little pessimistic himself about the winter fishing, his ears perked up and he agreed to head to the same spot with me the following week. 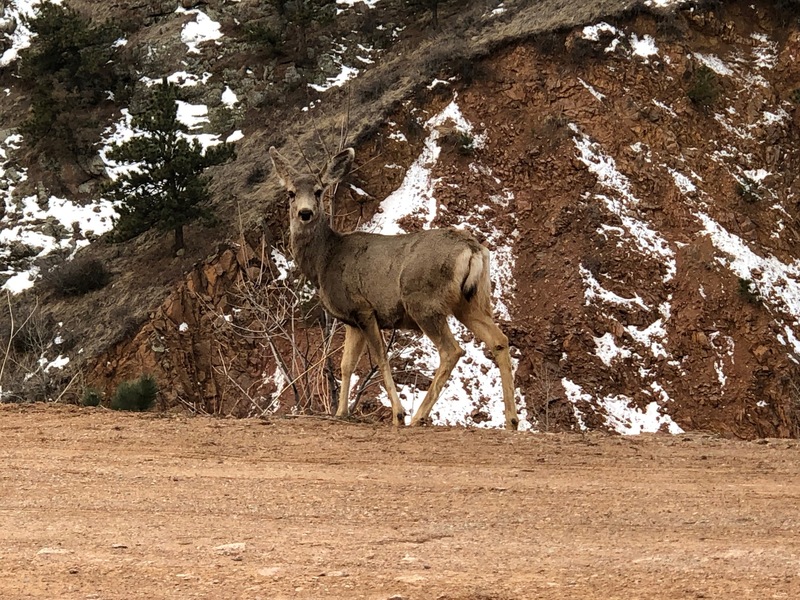 Just before the parking lot, we saw a small herd of deer. I’m not superstitious, but I do trust empirical evidence. And for whatever reason, whenever I see animals before I fish, it’s always a good day. We had to make it a short day because Dennis had to be back in town in time for a gig. But we packed a lot of fishing into that time. It was slightly warmer than the week before and the flows were still good. 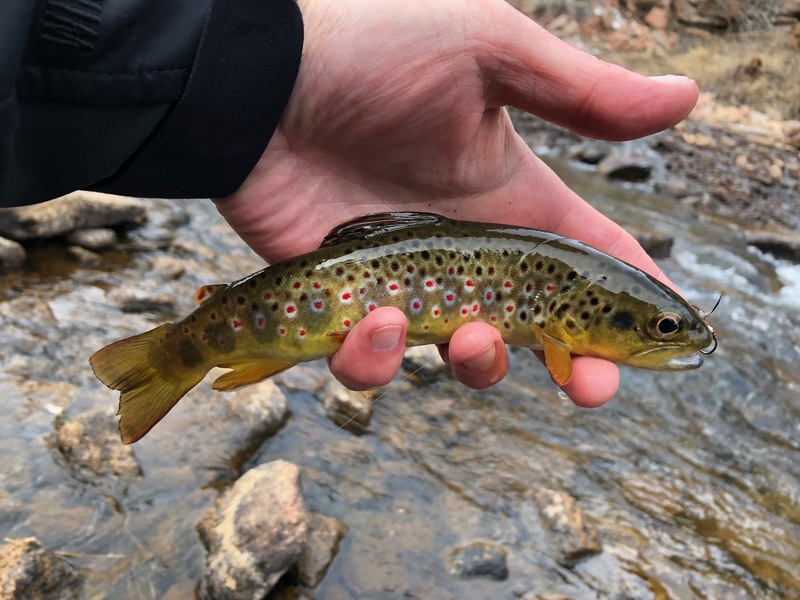 Both of us only caught browns, but they were beautiful. 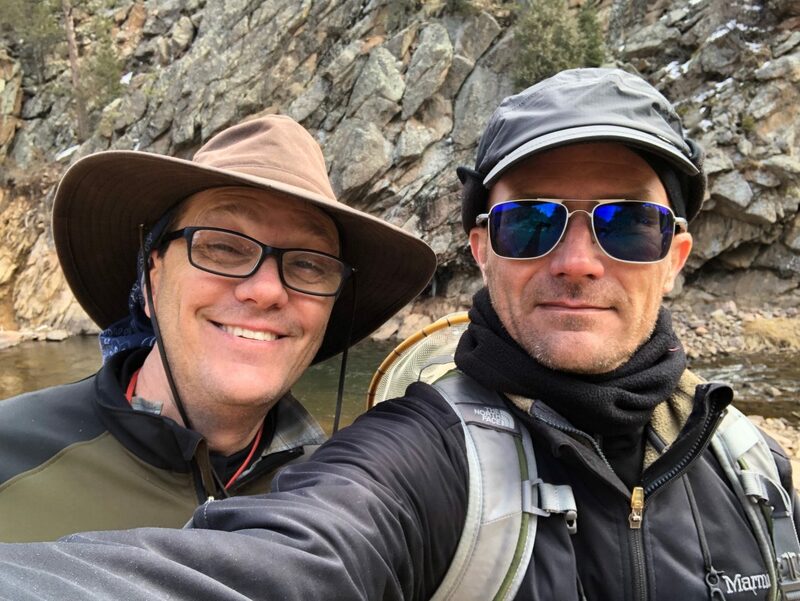 While I enjoyed the much needed solitude of the first trip, it was nice to have some company, and there’s not much better company than Dennis if you like to revel in brilliantly schizophrenic banter that meanders through philosophy, politics, design, art, travel, food, DIY, and tenkara. I think we both needed to indulge our mutual love for minutia as much as we needed to get out into nature. 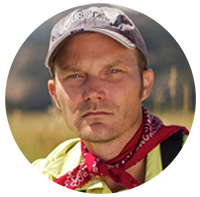 If Dennis’ name isn’t familiar, then you don’t read this blog. Because if TenkaraTalk were a play, he’d be one of the main characters. 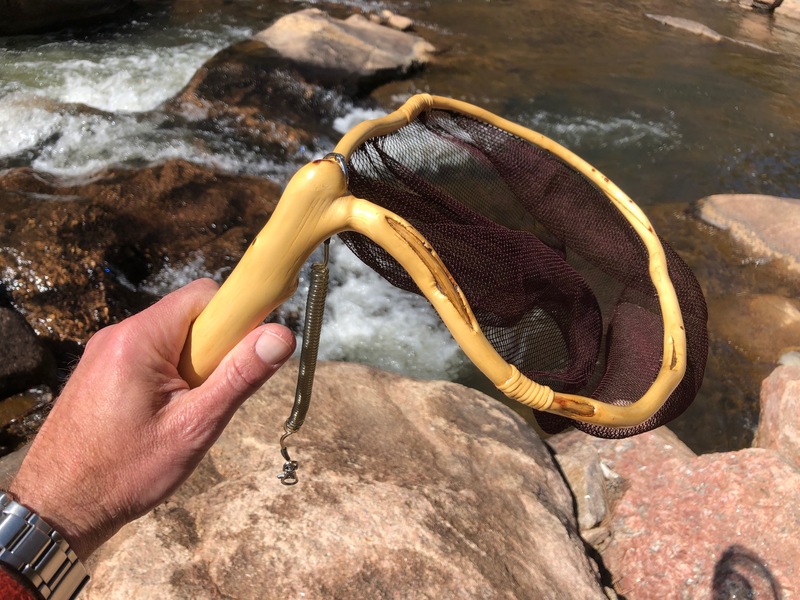 I write about him often, and am enamored with his unique handcrafted tenkara gear. 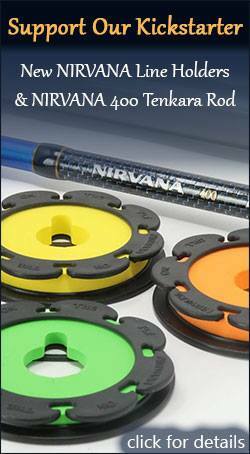 A few days earlier, we were talking about one of his new line spool designs–in particular how to store flies on it. He usually uses drilled holes with magnetic inserts, but for this one, he needed something different. The idea struck me that he could use a coil–a spring the way some of the old Perrine fly boxes used to have. I thought the metal and wood would compliment each other better than foam (I always feel that foam ruins the class of a wooden fly box) and lo and behold, he brought a couple of prototypes for me to check out in person! I also got to give my Tanuki Snow 325 a proper workout. 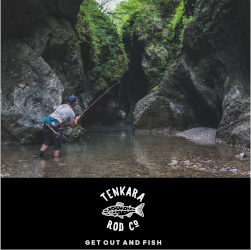 Daniel Galhardo of Tenkara USA needs no introduction. I always joke that we fished together more when he lived in California than we do now that he lives in Colorado. 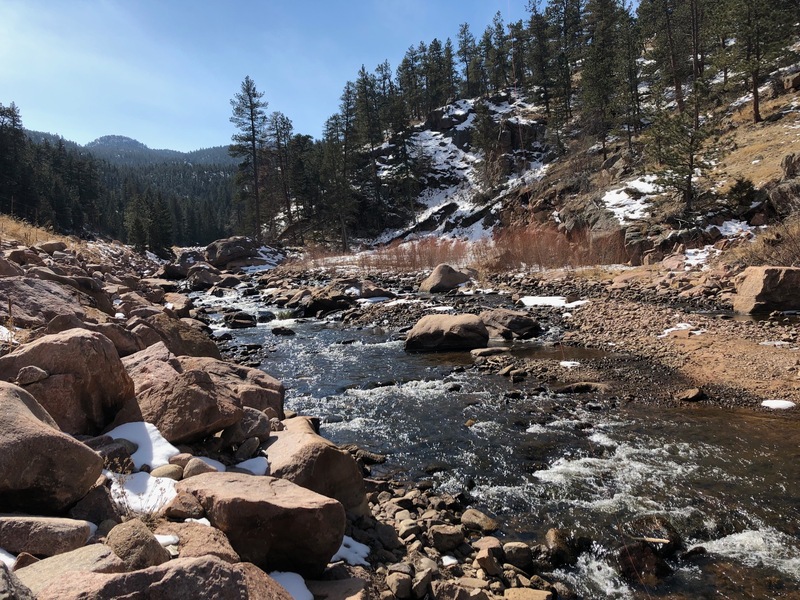 But our schedules finally aligned and having not fished the St. Vrain for a long while himself, it was a natural choice. 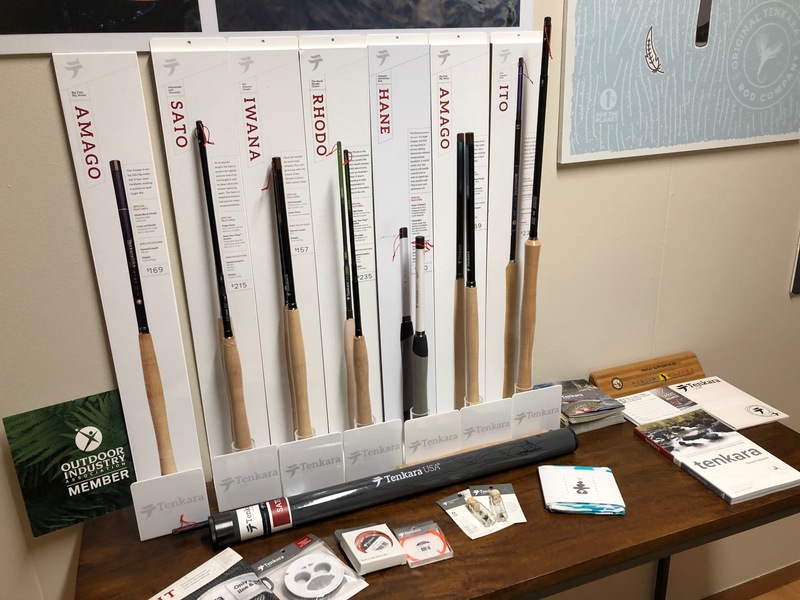 We met up at Tenkara USA headquarters in Boulder and I got to peek behind the scenes of what goes on at the company responsible for bringing tenkara to the U.S. and beyond. 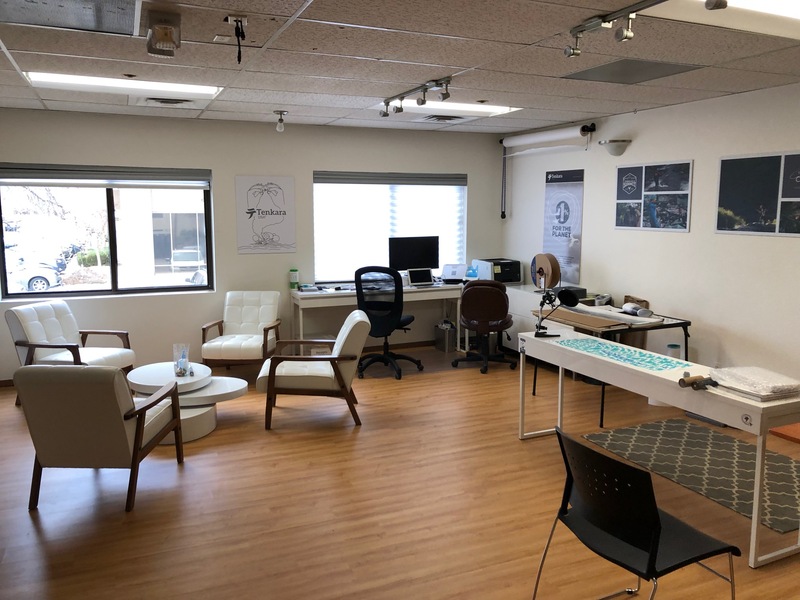 Having known Daniel since his entire company was run out of his apartment, it felt a little strange to see it all look so “official”, but also nice to see Daniel’s success manifest. 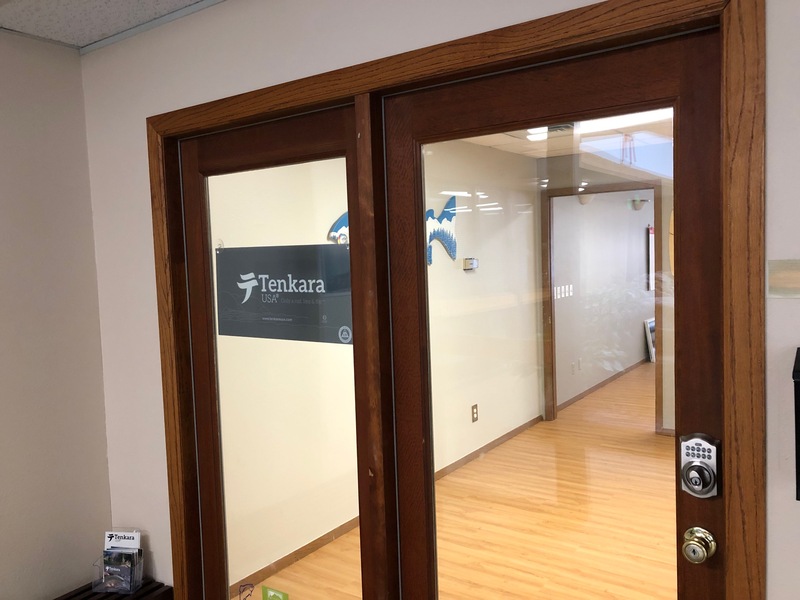 It’s a really cool space, and really reflects Daniel’s style and tenkara philosophy. 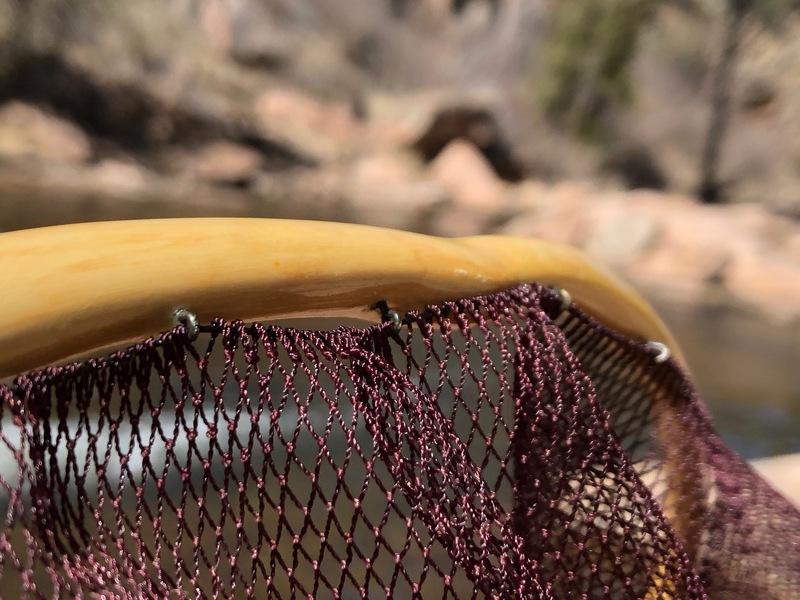 Luckily, there was plenty of great water downstream, so we headed back down and for the third time, the fish did not disappoint. 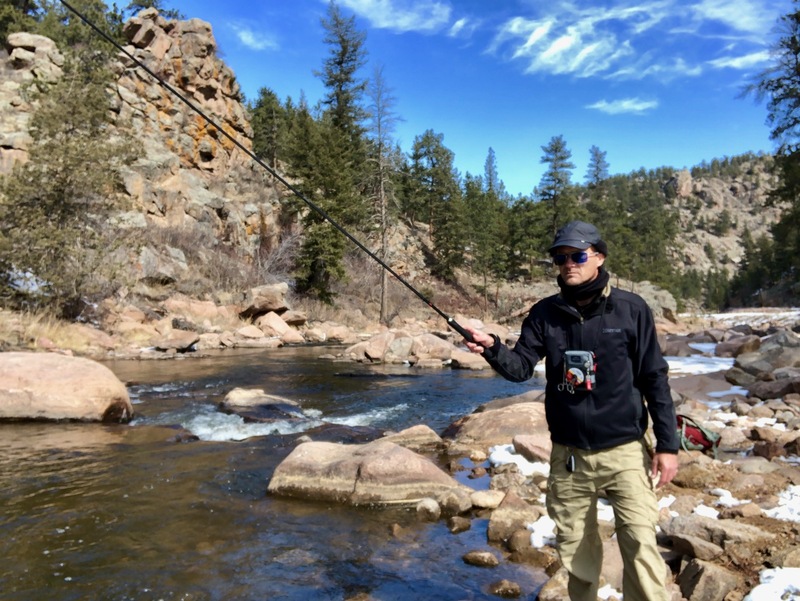 Daniel caught more than I did, but I caught one that was very special to me (keep reading). I’ve been experimenting a lot with using Shetland Spindrift Yarn and this is one of the patterns I’ve been testing that I’ll be writing about in an upcoming article. 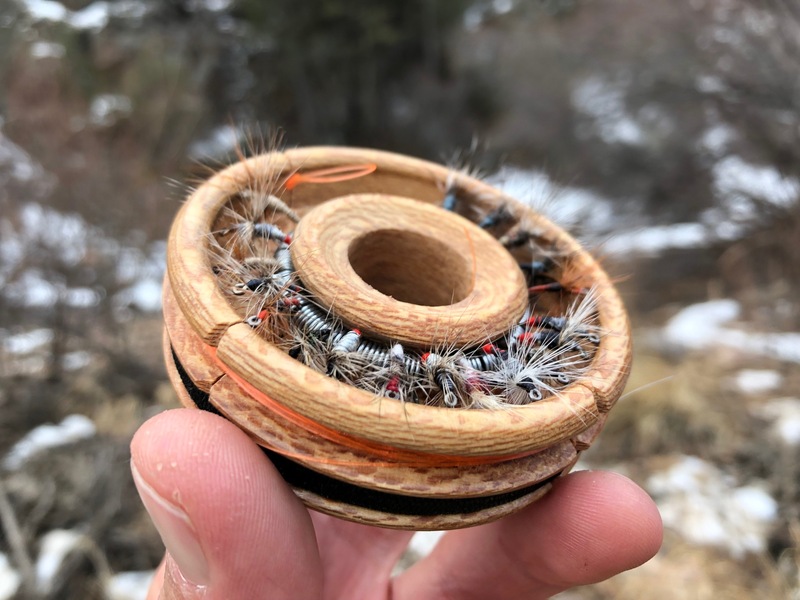 It’s a simple fly with paprika colored yarn and grizzly stiff hackle. 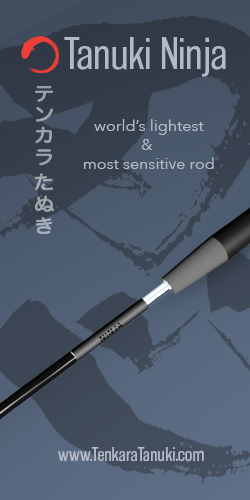 It’s the one I caught most of my fish on and just one color scheme in a series of patterns that have proven to be highly effective. More later. My girlfriend Cindy lives in NYC and we only get to see each other about once a month (if we’re lucky). The last time she visited, I taught her how to tie flies. 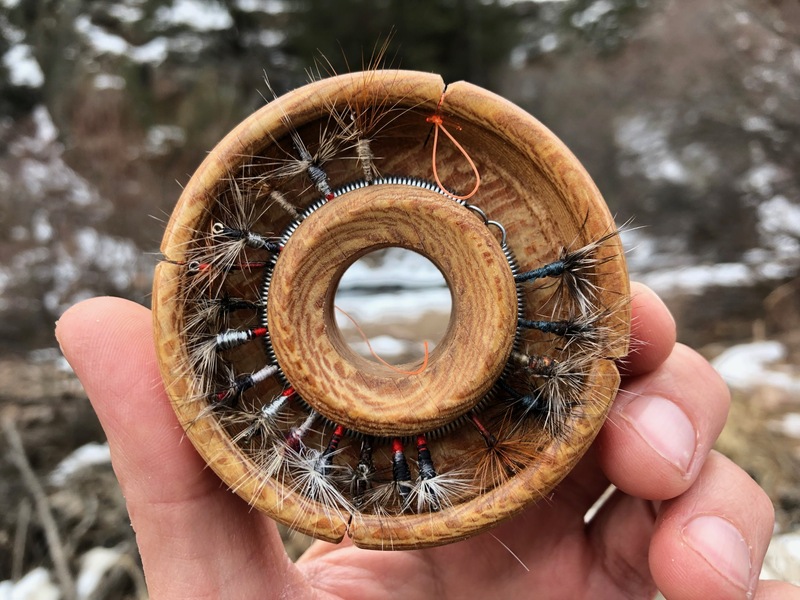 She’s never fished a day in her life, but she’s creative, dextrous, and intuitive and immediately fell in love with the craft of fly tying. She’s a natural. 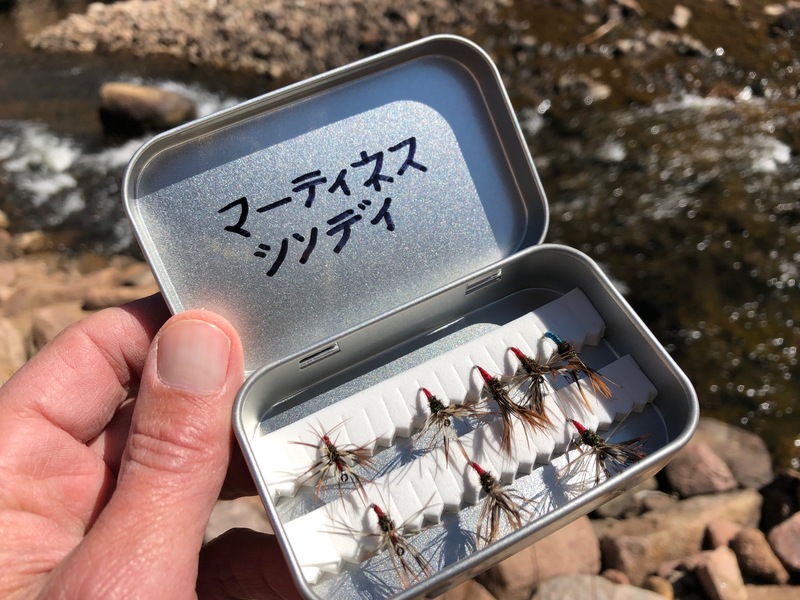 It wasn’t long before she filled one of my DIY Altoids fly boxes with takayama sakasa kebari. 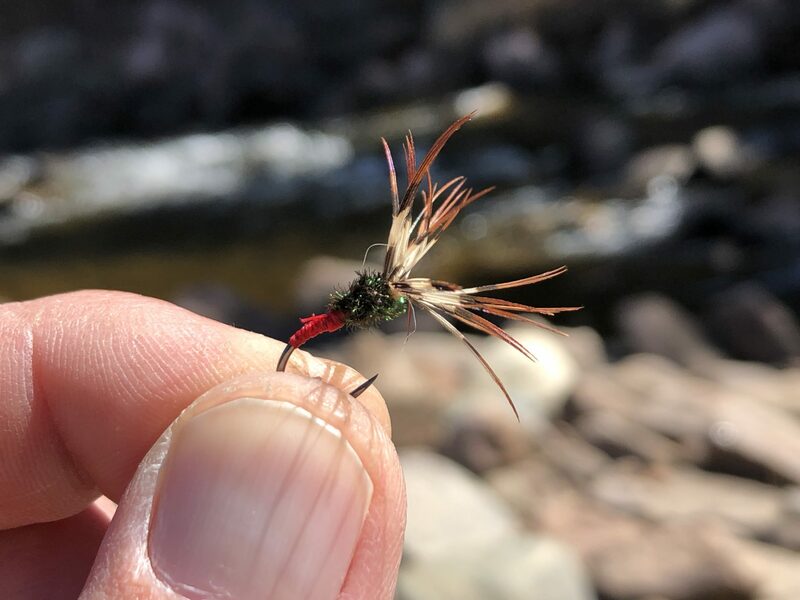 She’s in NY now but I promised her the next time I hit the stream, I’d try to catch a fish on one of her flies. And I did! It wasn’t the biggest fish, but so often, the most memorable fish aren’t. And this one was very special to me because for the brief moment I held it in my hand, it was like 2,000 miles of distance were bridged, and part of her was there in the water with me. 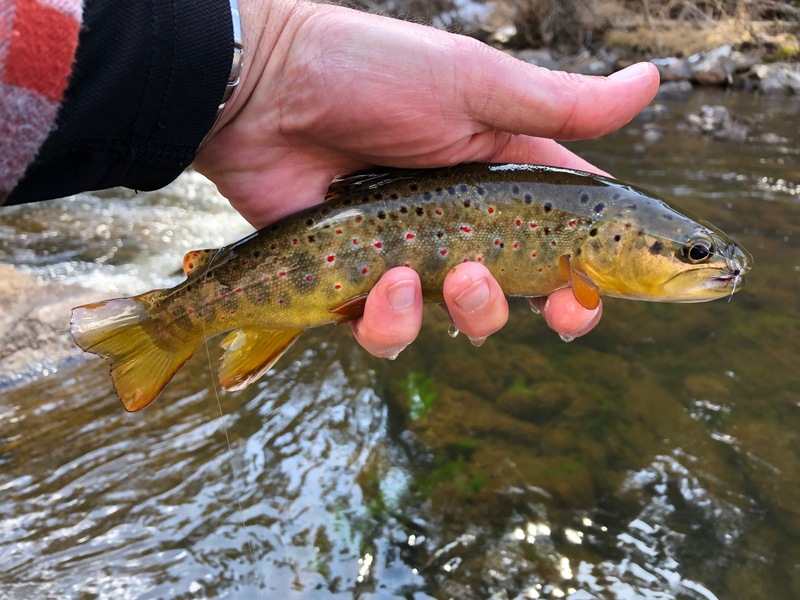 Another blessing from the St. Vrain. 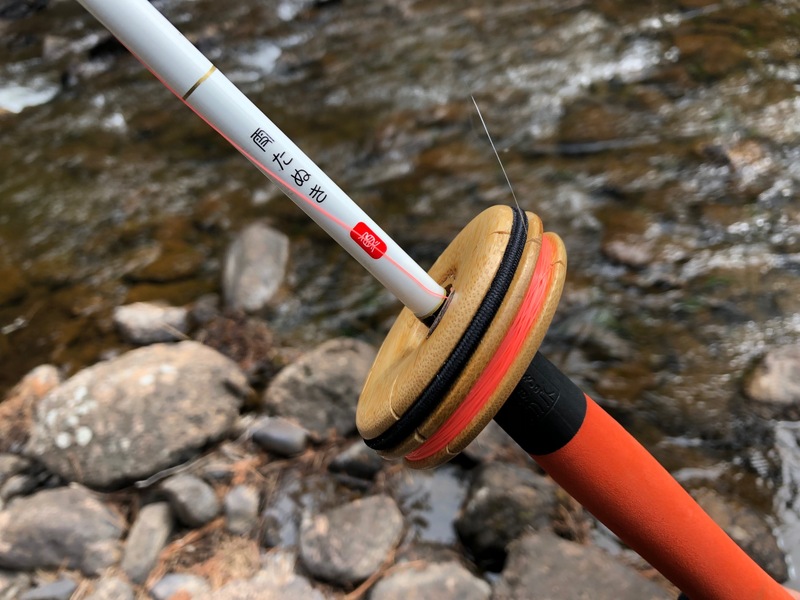 You’d think fishing tenkara as long as I have, I would have built my own tamo by now. But I just haven’t had the patience. Yet as anglers are wont to do, I couldn’t help but admire Daniel’s homemade net. 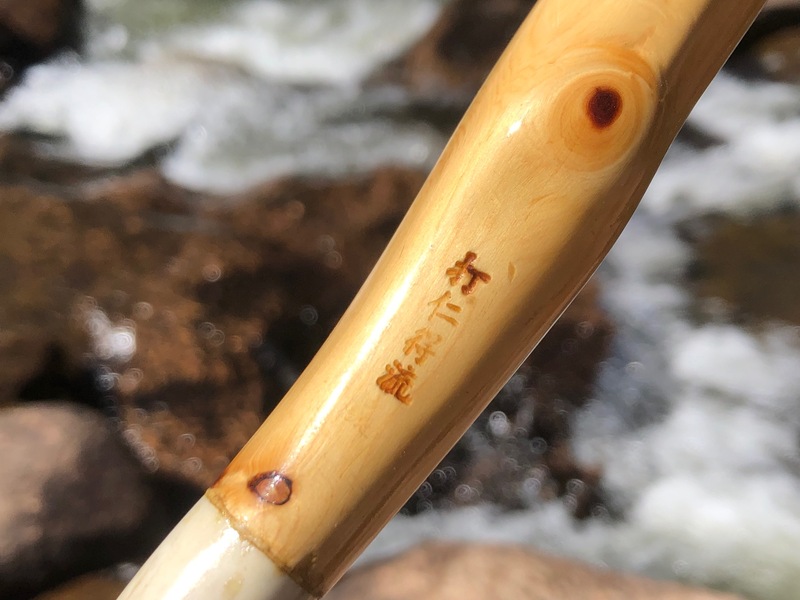 He made it from a spruce branch from the very stream we were fishing and it’s beautiful–finished with a deer horn handle and his name in Japanese. One unique feature is that instead of the conventional method of attaching the netting with wound string to the hoop, he used small metal eyelets on the underside. This preserves the beautiful anomalies of the natural wood and gives it a sleek look. 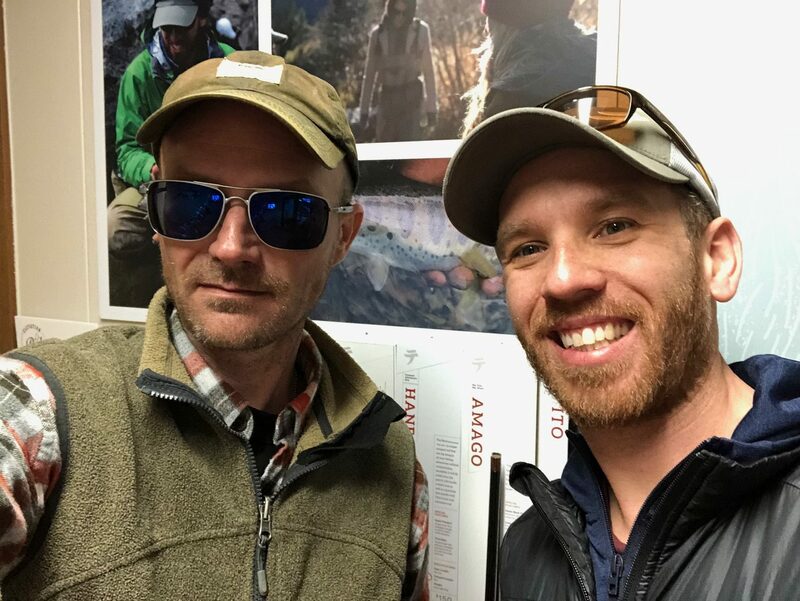 It was great to reconnect with my old friend, swap some stories and talk about where tenkara has been and where it’s going. 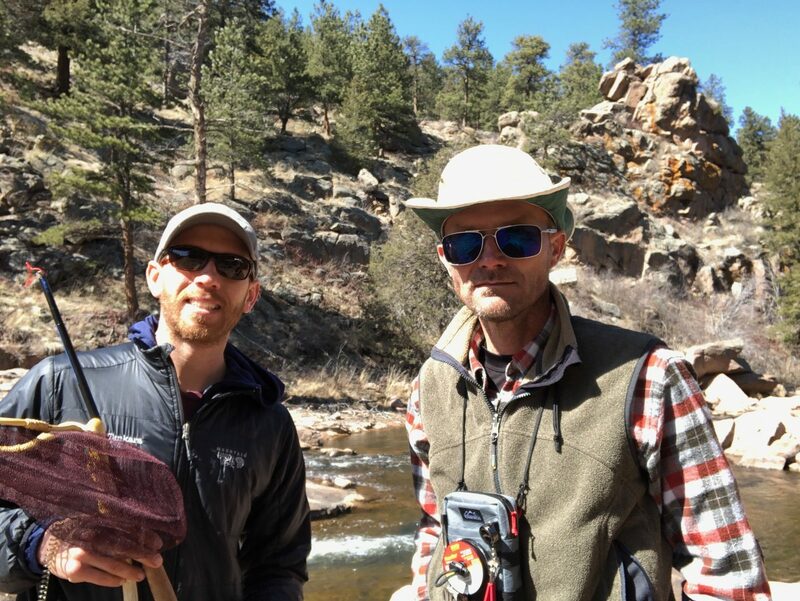 We promised to try to make more of an effort to fish together and even flirted with the idea of planning a trip to Wyoming. I really hope that happens because more than being a mentor, I consider Daniel a dear friend. 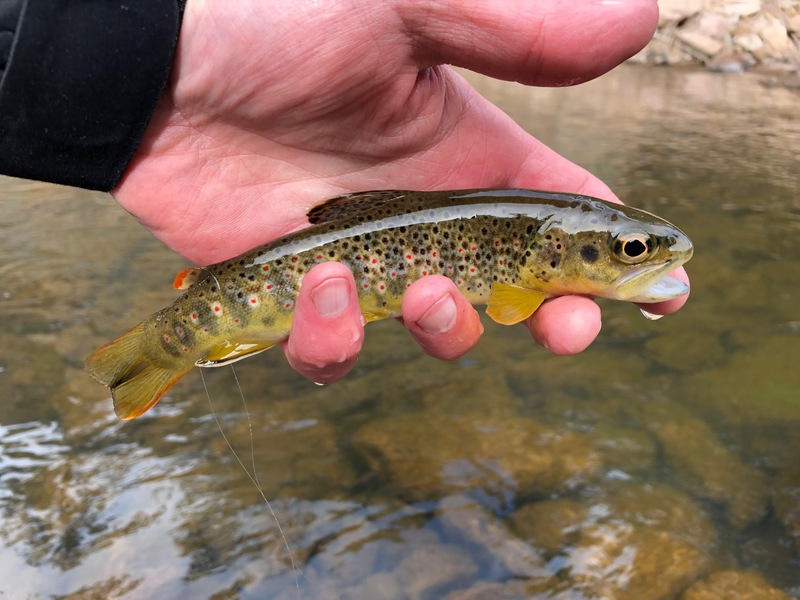 The St. Vrain has been kind to me this month, and has given me so much. So I’ve decided to give something back: a respite. My next trip will be elsewhere, but I’ll be back. 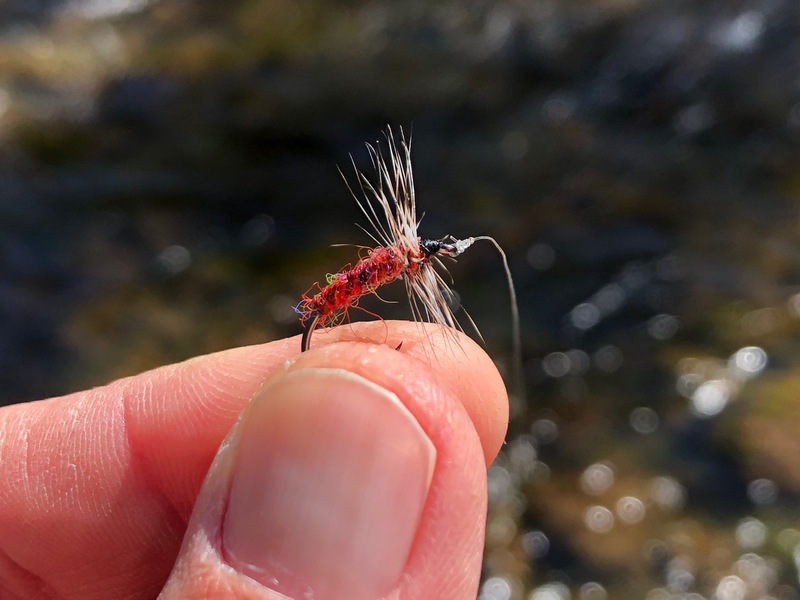 I’m already dreaming of returning in the summer months to hit some of those pools with dry flies after runoff. I can only imagine it will be even better. So for now, thank you St. Vrain. See you soon! Brother and I fished it in September when we grew tired of fishing the Park. 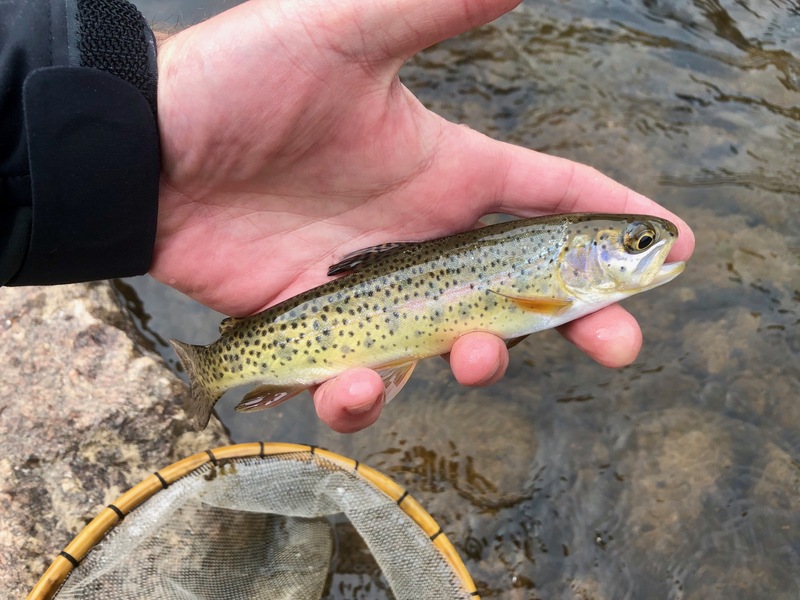 Browns and rainbows were quite enthusiastic and my brother found one cutthroat. We did fish further up into Wild Basin. Good to see others catching fish! 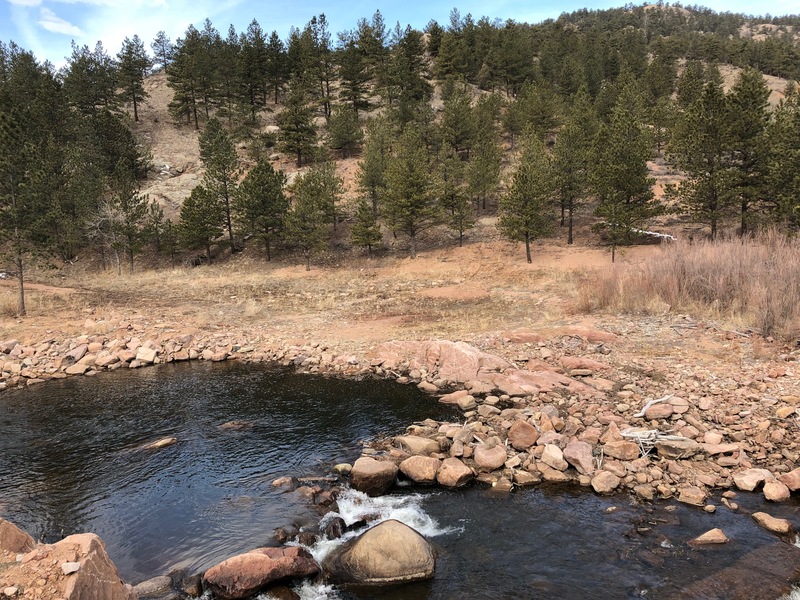 One of my favorite locations…only about a 10 minute drive from the house, so that helps. 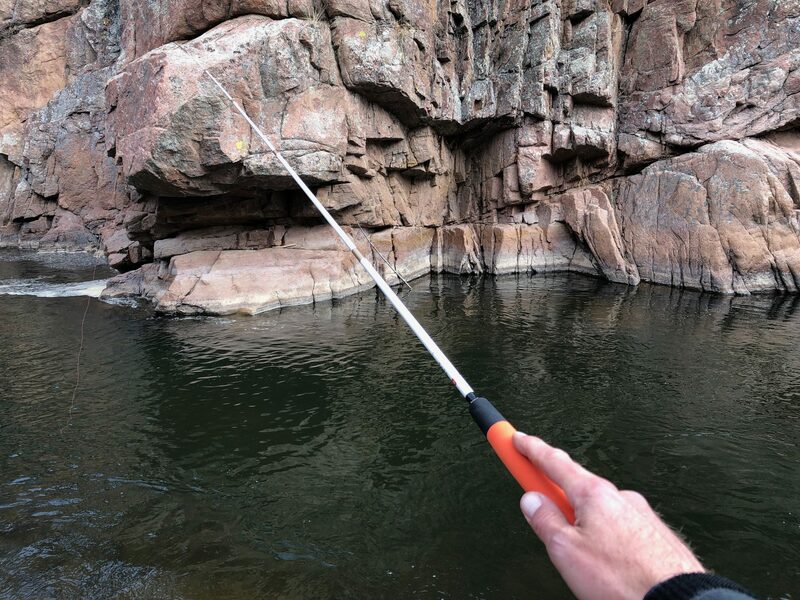 We had some good luck up there this past weekend…hoping to try out some other pockets on my next visit. What a lovely report. I think you have just described Heaven. Perfect. Once again a great post. 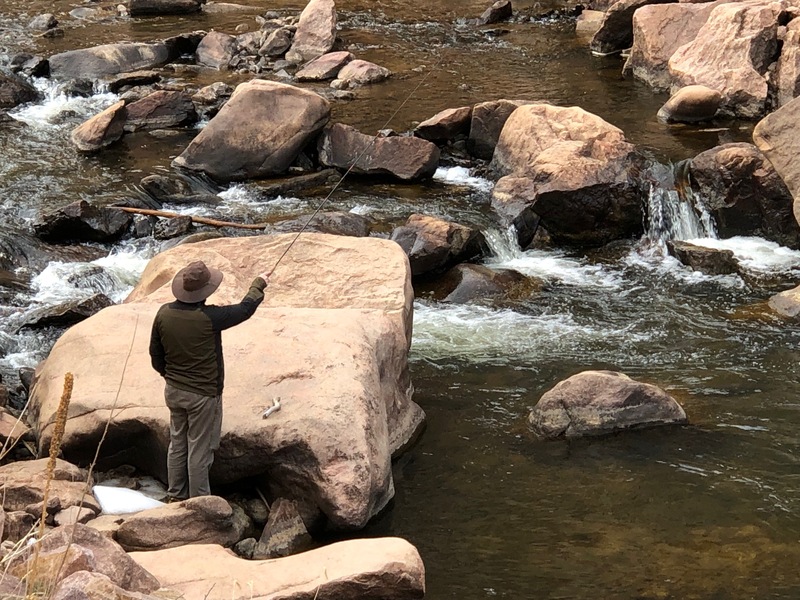 I had the opportunity to fish the St Vrain a number of years ago before the flood during a visit to Rocky Mountain National Park. Very enjoyable, beautiful area. Good times! Great way to get on the board and bring the first fish of the season to hand. Much enjoy the variations of brown coloration. It’s also nice to see the fish cradled and handled with care, as our finny friends so deserve. Everyone benefits. 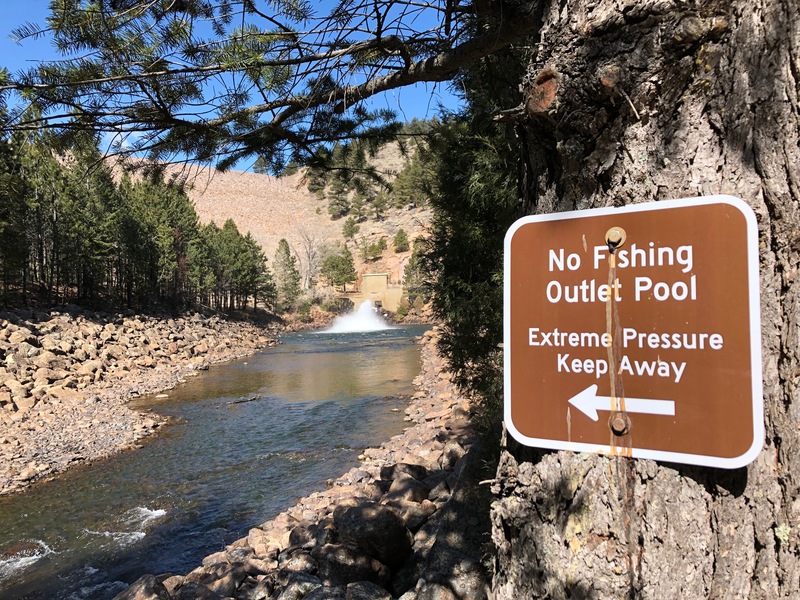 The option of not removing the fish from the water at all — “keep ’em wet — is also a practice encouraged by many who’ve studied catch & release survivability. Being in continual contact with the water help calm the fish, and they photograph nicely, with perfect fins flayed out beautifully. 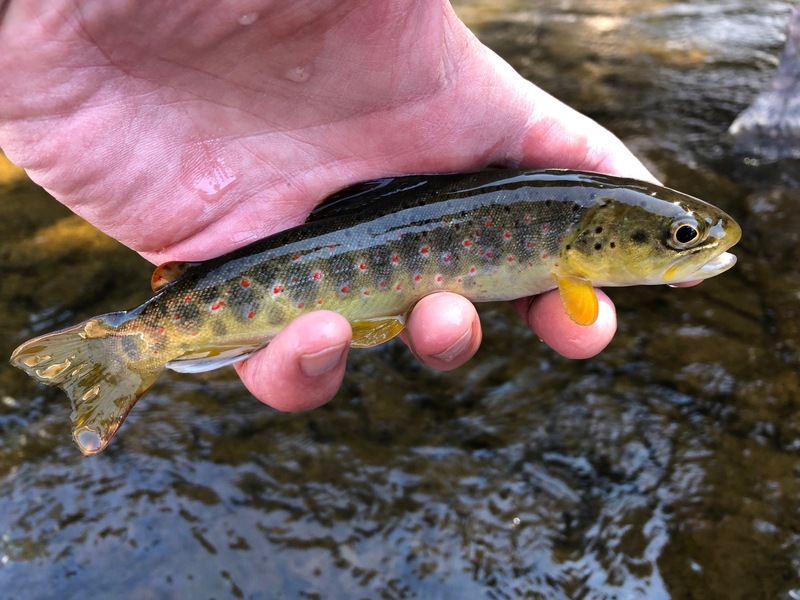 Interesting how Browns are often the first welcome us to a new season, and the last to bid us farewell, as we move to higher altitude as warm weather permits, and retreat again in the Fall. Looking forward to more posts and the parade of species. Thanks for all the great comments everyone! 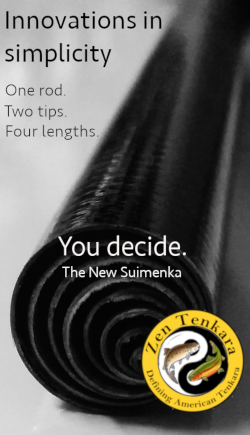 I’m making it a point to post more about my tenkara adventures this year. I hope you enjoy them as much as I do! What a great feeling this article gave me! 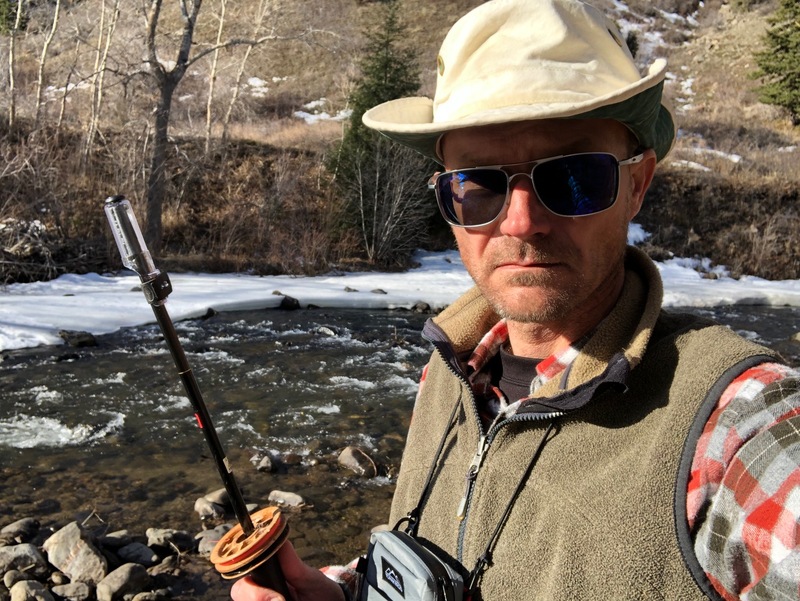 Like the breath of Spring air you got, it was nice to read about all the things OTHER than catching fish that brings (us all) such a joy when fishing- solitude, friendship, and reminiscence of people and places all wrapped into one month! 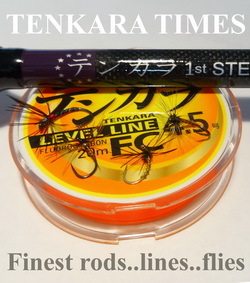 Can’t wait to get back to tenkara in CO!! Antony, let’s definitely plan a trip together when you get back. It’s been too long!